Be the first to share your favorite memory, photo or story of Alberta . This memorial page is dedicated for family, friends and future generations to celebrate the life of their loved one. 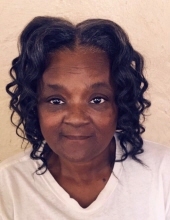 Alberta Jelks-Fitzpatrick, 62, of Decatur departed this life on Thursday, March 28, 2019 at St. Francis Hospital, Peoria. To send flowers or a remembrance gift to the family of Alberta Jelks-Fitzpatrick, please visit our Tribute Store. "Email Address" would like to share the life celebration of Alberta Jelks-Fitzpatrick. Click on the "link" to go to share a favorite memory or leave a condolence message for the family.